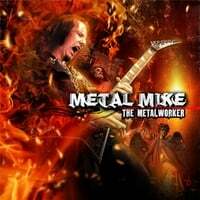 The amazing debut album from Metal Mike with Steve DiGiorgio (Death, Sadus, Testament), Bobby Jarzombek (Halford, Iced Earth, Fates Warning, Riot) and Tim Clayborne. Mixed by Roy Z. True no frills Metal featuring tracks "American Metalhead", "Speak The Name", "Bloody Wings" and many others. Considered by many to be the best Metal release of 2005. This CD comes signed by Metal Mike.